Interestingly, one of the frequently raised objections to the Catholic League's demonstration at the Empire State Building yesterday was that "Mother Teresa would not have wanted this recognition." I found this to be a somewhat topsy turvy analysis. Thank God that Mother Teresa would not have wanted all of the hoopla in her honor! What sort of moral, religious or spiritual leader would want that kind of recognition for themselves? If they would, they wouldn't be much of an example, would they? The point of the demonstration at the Empire State Building was not to satisfy any long held desire by Mother Teresa for attention, but rather to continue to hold her up as an example and a beacon of goodness for the world. And, in addition, to defend her from the slings and arrows that have been coming her way from some misguided and mean spirited commentators who are intent on maligning her reputation. 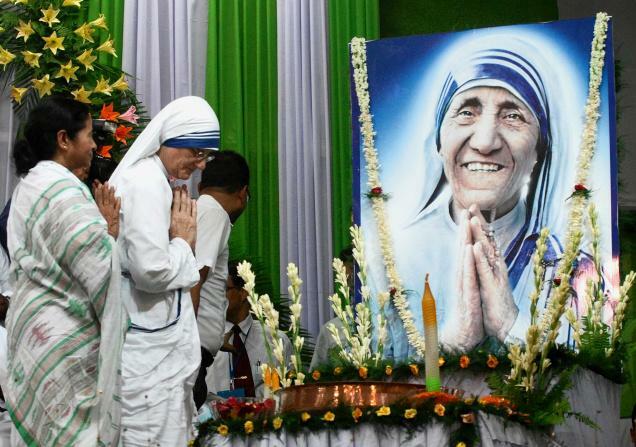 Mother Teresa probably did not want the notoriety or acclaim that she received when she was awarded the Nobel Peace prize some years ago, either. However, she was able to use that opportunity to speak out on behalf of the weakest among us; the unborn, the poor and the marginalized. So, although Mother Teresa would not have wanted all of the attention, just like any other saint or holy person, it is good for us to honor her and to keep her good works in the public eye as a light to the world.